“When I got there, I looked at all the projects and they were amazing, but I trusted that my project has a lot of capabilities to be used in the real world, so I thought I had a good chance of winning,” said Sobczak, a rising senior at Shorecrest Preparatory School in St. Petersburg. The project’s official title: Algae to Oil via Photoautotrophic Cultivation and Osmotic Sonication. In less dizzying terms, Sobczak cultivated, harvested and extracted algae oils and turned them into biofuel. Some research shows that algae fuel could one day be a significant part of the nation’s energy supply. But the cost of producing it remains high and scientists are working on ways to bring it down. “All these Floridians think that algae is bad because it causes red tide, but it can be used as a positive to help our environment and our economy,” Sobczak said. Among a trove of awards and scholarships from the Intel ISEF, Sobczak was given the opportunity to visit NASA’s Jet Propulsion Laboratory at the California Institute of Technology, where workers control the Mars rover, for three days this month. “(Sobczak) will get a behind-the-scenes experience of how JPL works: how we conceive and design missions, how we build and operate spacecraft, and then she’ll meet scientists who will speak about how they use spacecraft to discover new science,” said Larry Bergman, a program manager at the lab. The world’s attention has been on Mars because of the Curiosity rover landing and the Intel ISEF took that into consideration when selecting a prominent research lab to send a student to, Bergman said. In the past, students have gone to places like CERN, the nuclear research lab in Switzerland notable for having the world’s largest particle accelerator. “She’s motivated, she’s driven, she’s a grinder,” said her mom, Lila Sobczak. “Until she finds the answer, she doesn’t stop,” she said. Sobczak hopes to get into Columbia University or MIT to major in biochemical engineering. 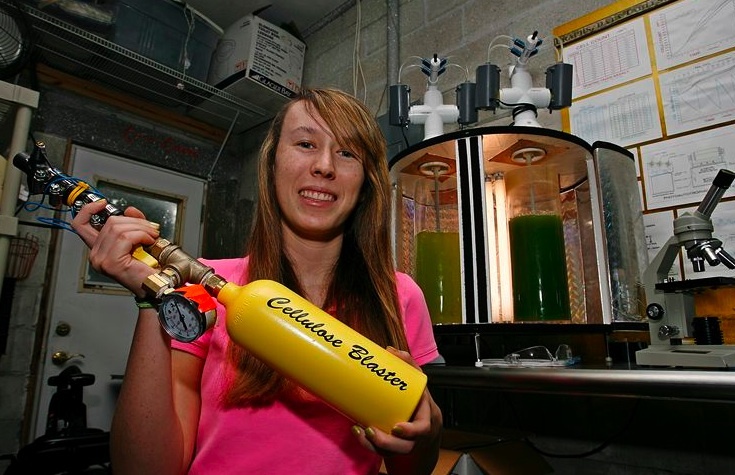 She’s excited to work in a college lab where she can expand her algae project. Sobczak’s dream job: working with other engineers to make algae a biofuel in the United States. We can’t help but to notice that biodiesel from 2nd generation feedstock is the focus of the most respected engineering and scientific organizations on the planet.